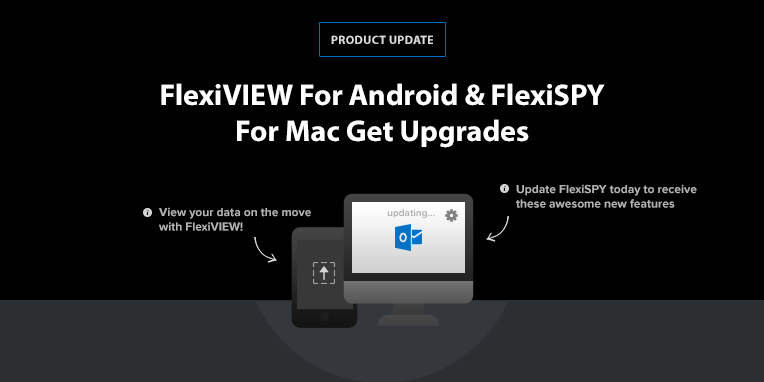 The FlexiSPY development team has been hard at work improving two of our most popular products: FlexiVIEW for Android – our free mobile viewer app – and FlexiSPY for Mac. These newest updates ensure you have even more access to the information that matters most when protecting your family, business, or personal data. Take a look at the upgrades below and stay tuned for even more as we continue to make FlexiSPY the world’s most powerful monitoring software. What’s New With FlexiVIEW For Android? Users of FlexiVIEW for Android will attest to the convenience and added security FlexiSPY’s mobile viewer app provides. Not only is FlexiVIEW free, but it also gives you access to your data directly from your phone. You can select which information to view, see which data categories have been active since your last login, view recent activity on your timeline, enable or disable calling, and even redirect to your online user portal – all from your phone! MMS: View the details and files of media messages (MMS) that are sent, received, or deleted by the target device. This means you will have access to the contact name and number, the text of a message, and the media file (picture or video) sent. RemCam: This feature allows you to take pictures remotely through the camera on the target device – and now you’re able to take these images of the phone’s surroundings from your FlexiVEW for Android app. Wallpaper: Keep track of the wallpaper graphics, photos, or artwork used by or stored on the target device. SpyCall: You can listen to a target device’s surroundings directly from your phone with our SpyCall feature. Simply enter your number into FlexiVIEW and call the desired phone from yours. If the phone is not in use, you’ll be able to hear everything that is going on without being detected. WhatsApp: Monitor conversations and their content – including photos, video clips and audio messages. Let us know what you think about FlexiVIEW for Android by taking our quick survey. Your feedback does not go unnoticed and helps us to improve this app and ensure your FlexiSPY experience is the best possible. What’s New With FlexiSPY For Mac? FlexiSPY for Mac now captures Microsoft Outlook 365 Webmail – one of the most widely used web-based email providers in the world. This means that FlexiSPY for Computers now captures the online version of Microsoft Outlook on both PC and Mac devices. This is especially important for companies and owners who use this email provider to conduct business, as well as for parents looking to keep track of the conversations their children are having, or for individuals who need to back up their emails. How Do I Monitor Microsoft Office 365 Webmail? We love hearing from you! Give us your feedback on FlexiVIEW, FlexiSPY for Mac, or any other products so we can continue to improve our monitoring software. If you’d like to see any additional upgrades or features made, let us know in the comments below! Subscribe to our newsletter to stay up to date on the latest information and product announcements from FlexiSPY!